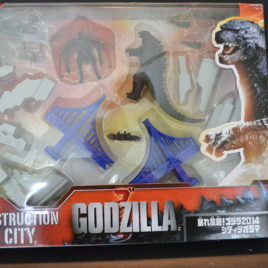 DESTRUCTION CITY PLAY SET! This wonderful play set from Bandai JAPAN will provide hours and hours of Godzilla fun. GODZILLA 2014 and the EVIL ALIEN MUTO fight it out with breakaway buildings to crash into and a bridge to destroy! 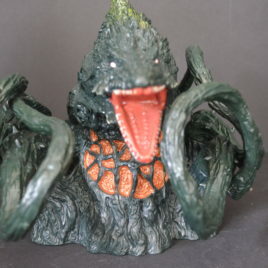 This amazing set includes an angry vinyl Godzilla 2014 figure and an evil looking Muto figure standing approx 4 ½ inches tall. Both figures are made of vinyl and are articulated for play. This awesome set also comes with a mini helicopter, two fighter jets and a Navy destroyer! DESTRUCTION CITY will provide hours of MONSTER ACTION FUN! Comes mint in box with JAPANESE packaging information. 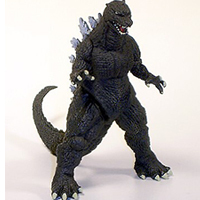 This is the soft vinyl Biollante figure from the 1989 movie Godzilla vs. Biollante. 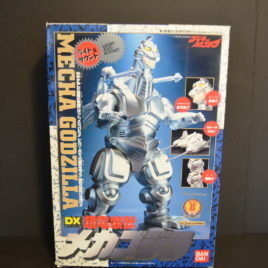 This is a very hard to find figure especially with BOX. VERY IMPRESSIVE!! Made by Bandai Co of Japan in 1992 this AWESOME VINYL BIOLLANTE figure is approx. 7 inches tall with a reach of approx. 14 inches. MINT condition! The Box has slight shelf wear but for TWENTY FIVE YEARS old it is in MINT to NEAR Mint shape. BARAGON!! This is the NEW REVOLTECH HIGHLY ARTICULATED BARAGON (the subterranian devil) from the 1965 Toho Sci-Fi movie "FRANKENSTIEN CONQUERS THE WORLD." This amazing new vinyl figure stands approx five inches tall and is 'SUPER ARTICULATED! This is Series # 004 of the SCI-FI Revoltech figure line. The detail is outstanding and the figure comes with a "Chalet" (crushed on top), trees and a small running horse. It is a scene right out of this exciting classic Toho movie. 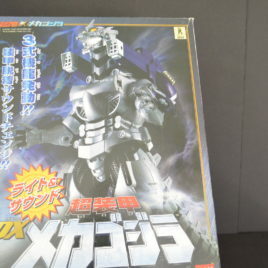 The figure and all the accessories comes packaged in a wonderful collectors box. For display or for play, this is a MUST FOR ANY COLLECTION! Does not come with "obi" on front of box. CLAWMARK TOYS WARNING: Not Suitable for very young children due to small parts. Scroll down for additional photos.